Daisy has just been appointed the new chef of Smiling Pasta! Everything was going swimmingly until Pastafast Chain shows up and decides to take over! 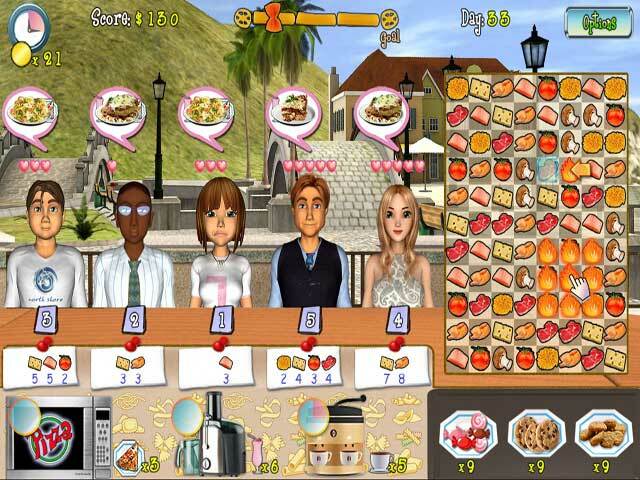 Help her run the business and turn a tidy profit to keep the corporate goons from winning in this challenging Time Management game. 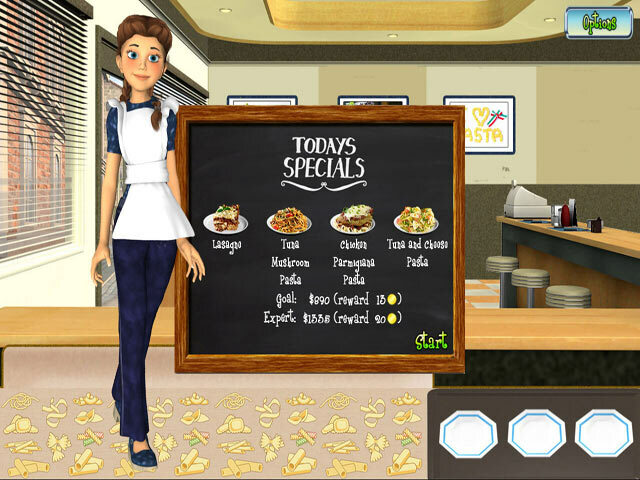 Upgrade the restaurant and keep your clients content to save Smiling Pasta! Smiling Pasta is rated 1.7 out of 5 by 3. Rated 3 out of 5 by trishydoll from Meh. 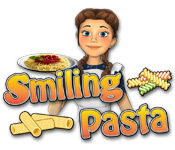 When I first saw the game, I thought the name "Smiling Pasta" was a bit odd. I downloaded the free trial anyway, just to see what it was like. I started to play and I thought that it was okay, but here's what I thought as the game progressed. The music was skipping & the game was lagging. The match 3 thing to make the order was a bit weird. If I were the creator of this game, I would make it as if you were actually making pasta, not playing a match 3 game and pasta appears. 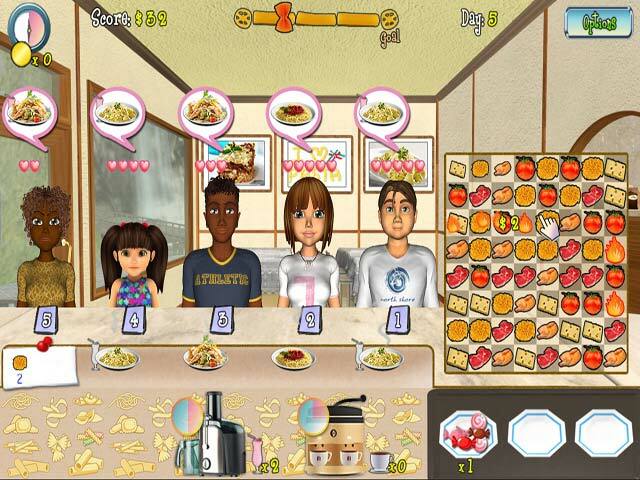 The customers were way too impatient; after 10 seconds of matching the food, they were already angry customers. & the snacks to keep them happy, well, they basically do nothing. I liked the customers' appearances (good job to the designer) but other than that, I wouldn't recommend buying it. Rated 1 out of 5 by chicasnana from Eh The game lags waaaaaay too much!!! It is very choppy in operation. And the graphics are really cheesy!! Rated 1 out of 5 by starry_lady from A Horrible Game If you've ever played Pizza Chef, Burger Rush, or Restaurant Rush, this game is almost exactly like those. There's just one big difference: this game is awful! First of all, the patience of the customers is extremely low, especially considering that actually making enough matches to meet the dish's requirements can be overly... challenging. Several of my customers left with only one heart because I simply did not have the required ingredients on my board. Granted, there's an easy mode to this game, but where's the fun in that? Secondly, finding a way /OUT/ of the game is even more challenging! I actually had to put the game into windowed mode, just so that I could exit out of it because any other conventional way wasn't evidently clear. In fact, I don't think that there was one. On top of which, there wasn't really a story line. There's not even really a plot. It just sort of delves into the story without any real explanation... I feel as if whoever wrote the actual story didn't try very hard. For me, it was too challenging and way, way too annoying. Even though the graphics were good, I definitely would not waste my game credit on this one. Daisy has just been appointed the new chef of Smiling Pasta! Help her run the business and turn a tidy profit!